Its digital and physical on so many different levels! Cool wireless pedometer thingy that even measures your sleep patterns. Yesterday, we repeated the EventUK presentations on Second Life, but this time IN Second Life as you can see. It all went fairly well apart from my poor Dell laptop not quite coping with changing the viewing angle very well – Second Life kept crashing. This actually underlined my point that Second Life still has it’s problems at the moment, with the reality of business laptops and networks. Please contact me if you would like to discuss any of the subjects raised or if you would like to understand how George P. Johnson can help you with your digital and physical events. Yesterday I presented at the EventUK tradeshow at the NEC in Birmingham. 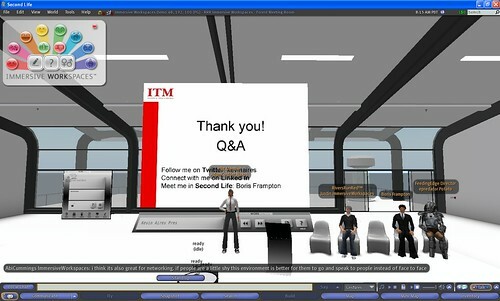 I had been invited by Eventia (the “trade body for the events and live marketing industry”), who were co-hosting a discussion on Virtual Worlds with ITM (“the leading professional body for buyers, managers and suppliers of business travel in the UK and Ireland”). My fellow speakers were Ian Hughes, Director of Feeding Edge, my fellow ex-IBMer colleague (of ePredator fame!) and Justin Bovington from Rivers Run Red, creators of the cool Immersive Workspaces TM platform. It was great to catch up with Ian and Justin beforehand and the session itself seemed to go pretty well. Ian kicked off with broader context-setting pitch explaining how Second Life is part of a wider set of societal trends. I like his analogy comparing the web to cave paintings – in that they both generally exist to explain things to people who were not there when something happened. Justin gave a case study of a successful event RRR ran with Intel and mentioned a number of other activties they were doing with a variety of companies. Unusually I had been asked to take the skeptics role. Having spent time working with a broader set of technologies since leaving IBM, this was easier than it might’ve been 6 months ago. I suggested that Second Life is great for a particular type of organisation and for a particular type of meeting, but that, with the best will in the world is has not yet ‘crossed the chasm’ into the mainstream. I went on to suggest that there are other technologies that have crossed the chasm – in particular the virtual exhibition platforms such as InXpo. Whilst these are not as engaging as Second Life or real life meetings, they do scale to thousands of users. There are also advantages to using these compared to real meetings – everything can be tracked and measured. I explained that there are ways to increase the engagement during these online meetings by using mini-games, serious games or even Alternate Reality Games (ARG). I showed how we at George P. Johnson had recently helped Cisco run their online Global Sales Experience – GSX with an invited audience of 20,000 across 80+ countries which included an ARG. Last year it had been run as a physical event in Las Vegas. I finished off by underlining that GPJ do not see this new world as Physical vs. Virtual, but that the real power comes when you combine these approaches to create a new form of marketing we call OnLIVE. This approach can acheive things never possible before, that either approach by itself simply cannot do. Perhaps the pinnacle of the OnLIVE philosophy is Augmented Reality – is it a physical experience or a digital experience. There is no distinction.